“If a parcel weighing 2 kilogrammes is delivered by a vehicle weighing 2,000 kilogrammes, we clearly have an efficiency problem”, according to Pasquale Grippa, researcher at the Institute of Networked and Embedded Systems at the Alpen-Adria-Universität Klagenfurt in Austria. As he goes on to explain, if a drone, which merely weighs a few kilos, were to deliver such a parcel instead, the necessary energy would be expended in a far more efficient manner. However, this is not the only argument in favour of the deployment of drones, as there is also the time factor to consider. Pasquale Grippa uses the delivery of defibrillators in emergencies to illustrate. The risk of dying due to the consequences of a cardiac arrest increases by 7 to 10 per cent during each minute in which help cannot be made available to the patient. If a defibrillator can be rapidly transported by air to the site of the emergency where it is then applied by a nearby person, the chances of survival increase considerably. Similarly, it is vital to transport medicines into remote areas, which are difficult to reach without functioning roads. These kinds of technologies are already in use: For example in Rwanda, where the US-American start-up enterprise Zipline supplies areas that are difficult to access with medicines and banked blood. Also established in the USA, the company Matternet is currently working on connecting laboratories and hospitals in Switzerland, in order to transport medications as well as blood and tissues samples from A to B more rapidly and more economically. Research teams around the globe are working towards ensuring that drone networks can act rapidly and economically. In Klagenfurt, within the scope of project SOSIE, scientists have specialised in advancing the system intelligence, addressing the following kinds of questions in relation to delivery services: Which customer will be served next? Which drone will serve the next customer? Which warehouse will the goods be picked from? What do the drones do while there are no pending tasks? “Part of our research is to develop a method for the dimensioning of a drone-based delivery service that can be used by a company planning to deploy such a system”, Grippa explains. In their calculations, the team of researchers relate the monetary costs to the expected delivery times. The results reveal different behaviours for different task allocation policies. “The systems involved here are highly complex and much still remains to be discovered about the key parameters for performance optimisation”, Grippa explains. After all, “the customer does not want to wait.” The research group, which is funded by the Carinthian Economic Development Fund and which collaborates closely with the Lakeside Labs GmbH, considers a high degree of autonomy to be of paramount importance. “The intelligence should not emanate from someone who is controlling the system from the outside, but should develop from within the drone network in a self-organised manner.” Thus, the drone researchers are working at the point of intersection between mathematics and artificial intelligence. So, when will we really reach a stage when anyone can have a book, a pair of shoes, or a box of chocolates delivered to their home by drone? 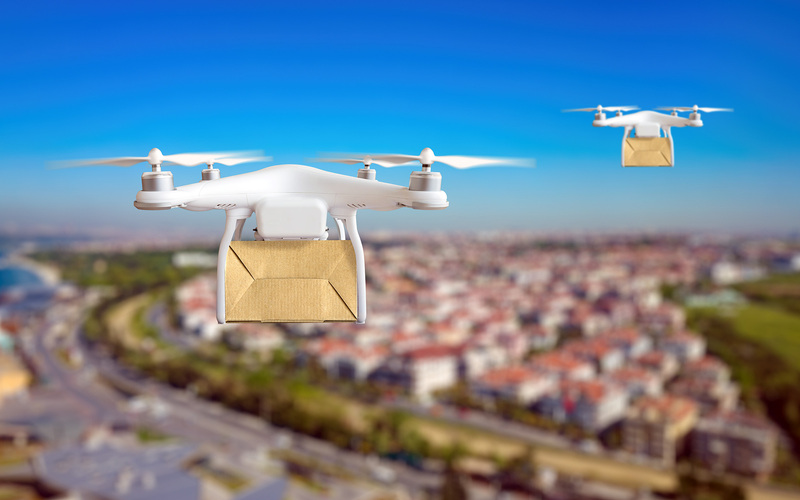 According to Pasquale Grippa’s estimation, it is feasible that cities will (almost) exclusively have drones working as couriers in around ten years’ time. The technology serves to highlight a very interesting niche offering great potential for start-ups. Meanwhile, jobs as couriers or working for delivery services promise very little future potential: “That is quite true, but as a society we also have to ask ourselves this question: What other, more interesting jobs might the future hold instead? Or maybe we will all be able to work a little less in a world characterised more profoundly by digitisation?”, Grippa suggests. Autonomous Robots, Special Issue on Robotics: Science and Systems (RSS), June 2018. This article was first published in German language in the eMove360° magazine (04/2017). It is also available at Dronehub K. Photo by Adobe Stock.